Bullet journaling (abbreviated as “bujo”) has taken the world by storm, from its simple utilitarian roots to the colorful and whimsical spreads found across Pinterest and specialty Facebook groups. Some bujo users create new themed spreads for each month or week, including a variety of planning tools like a calendar, to-do list, cleaning schedule, and mood tracker. Bullet journaling is a great way to unplug from technology, focusing on an analog tracking method that relies on pen and paper instead of having an app for that. It’s great for long term planning and also for staying on top of day to day tasks, especially if you’re an achievement-oriented person who loves the feeling of checking off a box on a list. Suddenly making that phone call seems a lot more rewarding when you get to cross it off and bask in the accomplishment! People have even reported anecdotally that keeping a bullet journal helps to reduce their symptoms of anxiety, since there’s a consistent practice to return to during the day to help list out and make a plan to tackle anything life throws at you. We’ve also reported before that plants have the benefit of reducing anxiety and boosting productivity, so it makes sense that these two hobbies can combine to make you a bullet journaling, plant growing powerhouse who can take over the world! Or, at least, your to-do list. Here are some ideas of spreads you can make in your #bujo to combine your love of plants and journaling. This basic spread can be upgraded however you like to track any aspect of your plant care routine. This example is a watering schedule you can check off or fill in when your plants get their weekly (or monthly) water. Perfect handwriting not required… obviously. Make a spread to monitor your watering, fertilizing, dusting, pruning, rotating, or other plant care schedule. You could also make a note every time you see a new leaf, or make an individual spread to chart each plant’s growth. On the left, watering cans each pour out three habits or tasks to water the seeds of your goals this month! On the right, each leaf gets filled in when you perform a daily habit like drinking enough water, going outside, or writing in a journal. March is coming, and with it will come the first day of spring! Why not do a plant themed March planning page with healthy soil, roots, leaves, and flowers to show you the way? Sketch a doodle of your top wish list items! PS. Yes, that’s glittery purple gel pen on the Zebrina. What else could we possibly use for its shimmery leaves? If you’ve got your eye on a particular potted pal (or seventeen), keep your wish list in your bullet journal! Don’t remind me that I misspelled Piranha Plant. This is why you use pencil first, THEN spell check, THEN ink. Make a doodle page for plants from your various fandoms and favorite tv shows, video games, or books. Cleo really appreciates the new watering checklist spread. Sorry, Cleo. Draw each of your houseplants and keep notes on their preferences. Do they have a favorite song? Do they like a certain spot in the house or else they throw a tantrum? Do they look very handsome in their new pot? Keep a list of your plants and their attributes. Are they pet friendly? Good air purifiers? Edible? 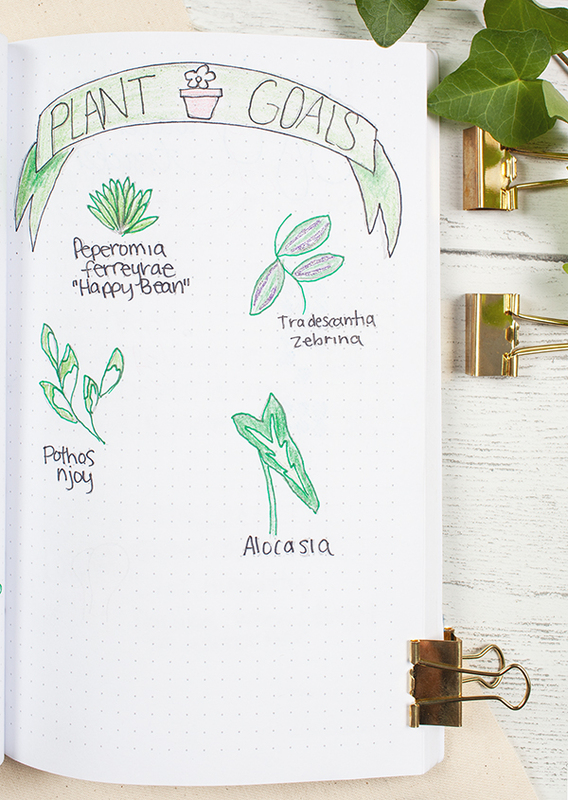 Put a plant-loving spin on other trackers you might keep in your bullet journal. Maybe every day of the week you write is a petal on a flower, or each of your runs during half marathon training can be recorded on a leaf, with that week’s total on the pot for easy tracking of your weekly mileage. Do you bujo? Show us your plant spreads!